Due to overwhelming received emails of people disappointed that they missed the registration of The Crochet Crowd Cruises for Feb 2015… we decided to ask Red Heart if we could have more guests on board. Red Heart provided us yarn support and we cannot do a cruise without them. The Red Heart Team loved the photos and the enthusiasm as they browsed through our galleries. They loved the energy, community and what we had accomplished. At 1pm Eastern Standard Time Today… TICKETS WILL BE AVAILABLE. Crochet Crowd Cruisers, Mexican Riviera – Feb 2014. To simplify the booking process, you can now book directly through our website. It is safe and secure. Once you confirm your booking for the cruise tickets, we have a $50 registration fee per crochet cruise person. If you family or friends coming with you that don’t crochet, they are not required to pay our $50 USD fee. You need to pay this fee to firm your seat with our activities. Our fee is non-refundable. Please ensure you are available prior to booking our cruise. We have 12 Passengers already doing Back to Back Cruises. Meaning… they are on both. Registration Fees are discounted at $90 which covers you for both. You can sign up for both cruises as long as we have availability on both ships. The Back to Back option will turn off once one ship is sold out completely. 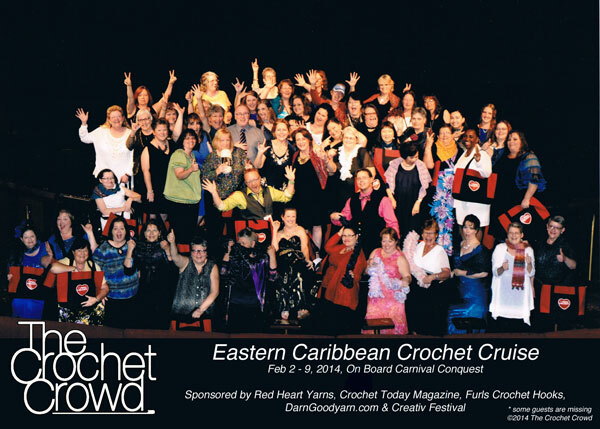 40 Seats – Exotic Crochet Cruise, Feb 7th, 2015. We have 71 Passengers Booked Already. 10 Seats – Left – Love to Crochet Cruise, Feb 14th, 2015. We have 93 Passengers Booked Already. Most rebookers decided this cruise as they were already on the Exotic Cruise Schedule for the 1st Crochet Cruise this year. We allowed passenger from this year to rebook on the ship if they wanted to. We had nearly 50% of our cruisers this year re-book. Though we had a 120 limit in all. Due to the rebookings of this year’s passengers, we ended up with 173 confirmed passengers so far. Red Heart was extremely impressed by the re-bookings and realized we way exceeded our goals. They decided to give more to help us out. Thank you to Red Heart Yarns for their generosity to go above and beyond! 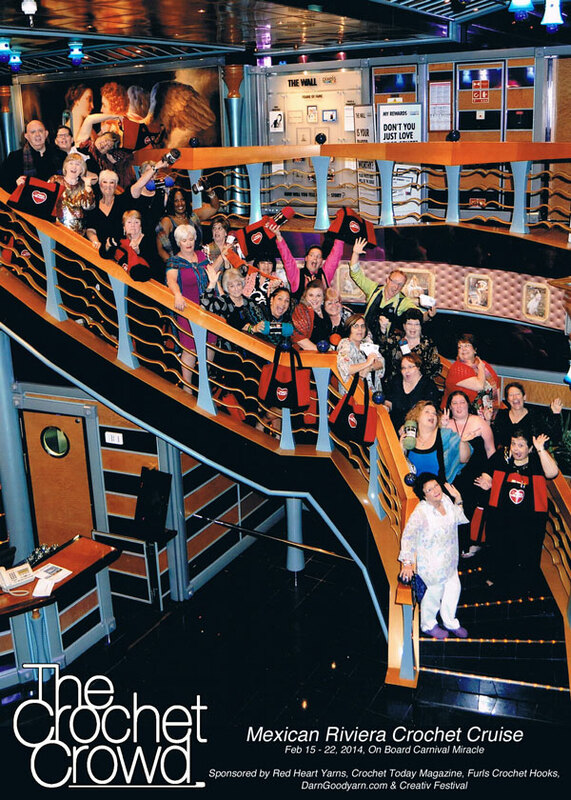 This entry was posted in Announcements and tagged Crochet Cruise, Crowd, Mikey, Red Heart. Bookmark the permalink. Nice! That means that I will have the opportunity to meet even more hookers!